Rio de Janeiro is a beautiful city unlike any other on the map! Celebrate the Carnival festivities at the Marvelous City Ball, a one-of-a-kind event dedicated to the city of Rio itself. This is an unforgettable night honoring the wonders of Rio de Janeiro, nicknamed “the Marvelous City” by the people of Brazil. This ball is popular among Cariocas, and provides visitors a great opportunity to experience the unique character of the locals and to appreciate the spirit of the city from which they come. 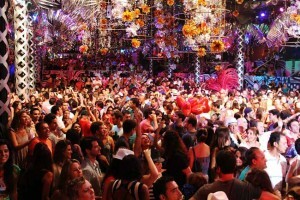 Celebrate Rio by booking your City Ball Tickets today on RioCarnival.net! For over 40 years, Rio de Janeiro’s Scala Nightclub has hosted Rio Carnival’s annual Scala Balls. A significantly more affordable option when compared to the exclusive Magic Ball at the Copacabana Palace Hotel, the nightly Scala Rio Balls refer to a series of six of Rio Carnival’s most famous themed dance parties, including the Bola Preta Ball, the Gay Gala Ball, the Beer Ball, and the Mangueira Ball. The Scala nightclub is a symbol of Carnival in Rio. The club moved from Leblon to downtown Rio in 2011, and is currently located right next door to the historic Municipal Theater in Cinelandia. With the switch to its current location, the new Scala nightclub increased significantly in size and now occupies a 3,000 square meters (3/4 of an acre) facility offering 3 ballrooms with a maximum capacity of 2,000 people. At the Scala Balls there will be multiple bars offering drinks and food. Scala Balls offer two types of tickets: Standing and VIP. Standing tickets offer you access to the bars and dance floors, whereas VIP tickets include unlimited drinks from the bar (whiskey not included) and a buffet of sushi, fresh fruit, and other snacks. You can take a taxi or the subway to the Scala Balls, as the venue is conveniently located less than 100 meters away from the Cinelandia metro station.